I was talking to a friend recently about how much I love getting my fingers into paint, and how it made me feel like a five year old again. We both agreed that the squidging of paint between our fingers and allowing ourselves to get messy was very satisfying and relaxing. “But some kids today don’t like finger painting according to a teacher friend of mine” she piped up. “What do you mean kids don’t like finger painting?” I asked somewhat stunned – that had been my absolute favourite until I was told I had to use a brush at Intermediate School. 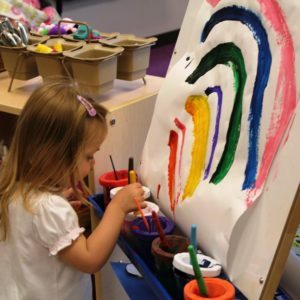 “Well my teacher friend told me that parents have become so obsessed with keeping their kids clean that the kids now don’t like putting their hands in paint. 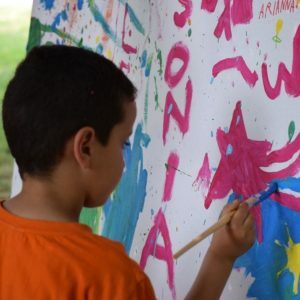 Paint on your hands means being messy, and Mummy doesn’t like me getting messy.” Oh my goodness I couldn’t believe it, what an absolute shame, there are kids missing out on discovering themselves through creativity – don’t the parents know how important that is to kids development I wondered? So I decided to do a little research into why getting messy is good for your kids (and you), and I put together the following reasons why you should let your kids play with paint. 8. Helps them to understand and describe colours – very useful if you want your children to understand that a red road crossing light means stop and a green crossing light means go (for example). So why not get yourself down to the local craft store, buy some finger paint (best to use the correct paint as young kids have a tendency to want to taste everything lol) and get some big sheets of white paper to create on. Also to reduce stress for you I would suggest that you buy them a plastic apron or coverall, plus put newspaper down on the table (and probably the floor) – and prepare to get messy with your kids. And … don’t worry it all washes off with a little warm water and some dishwashing detergent. Do let me know how you get on – I would love to see what your little one’s create so if you would like to share with me please comment below. PS if you would like to get some simple creative ideas you can do in less than 10 minutes a day download my free eBook ‘7 Days to BE Creative Be You” now.